It has to be said that the famous Girard-Perregaux Tourbillon with Three Gold Bridges is always firmly grounded in the present, despite its 152 years of history. Shown off to excellent effect by a round case carved out of pink gold, its characteristic design symbolizes supreme harmony between art and technique. It is thus the perfect embodiment of an exceptional Haute Horlogerie timepiece. It was first hand-crafted by Constant Girard-Perregaux back in 1860. Its mechanical movement is placed under three parallel arrow-shaped bridges. This was a revolution in the history of Haute Horlogerie, imposing for the first time a watch's mechanism as an element of design in its own right, beyond its technical function. In 1884 the watchmaker submitted an application to the United States Patent Office to protect the design. 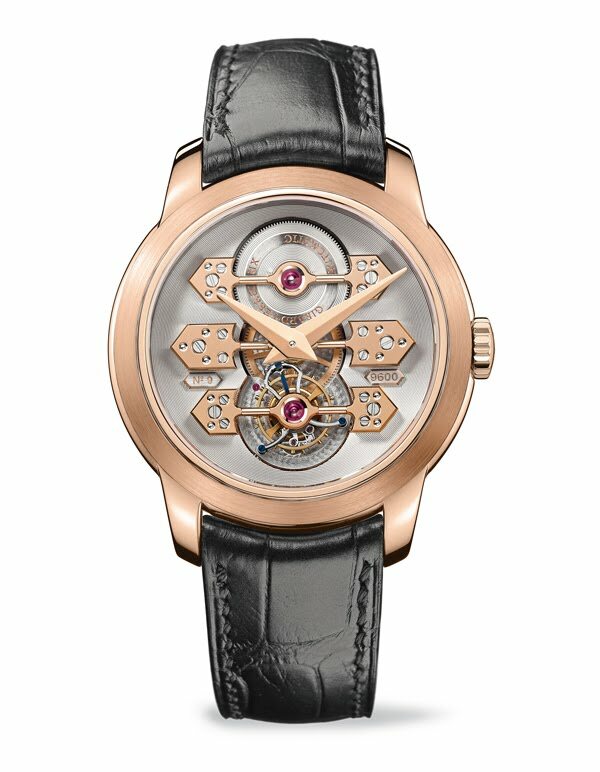 Girard-Perregaux received the supreme accolade when the Manufacture was awarded a gold medal for its Tourbillon with Three Gold Bridges at the Paris Universal Exhibition of 1889. Single-handedly this masterpiece thus brought the House of Girard-Perregaux renown of epic proportions for its expertise, and with its extraordinary impact came to symbolize an entire period in the history of fine watchmaking. The expression of a unique heritage whose origins can be traced back to the mid-19th century, this new version in pink gold is available in a strictly limited edition of only 50 pieces. Contained within its diameter of 41 mm that adapts perfectly to the wrist, its three arrow-shaped bridges attract all eyes. Their pure geometry can tolerate no compromise - any imperfection would immediately be noticed in the light. Their finishing, undertaken entirely by hand, requires outstanding nimbleness and concentration, qualities to which only a small number of watchmakers can aspire. In the noblest tradition of fine watchmaking, the bridges are rounded-off and the beveling takes on a gently domed appearance, giving them perfect contours throughout their length. Here, precision is master. 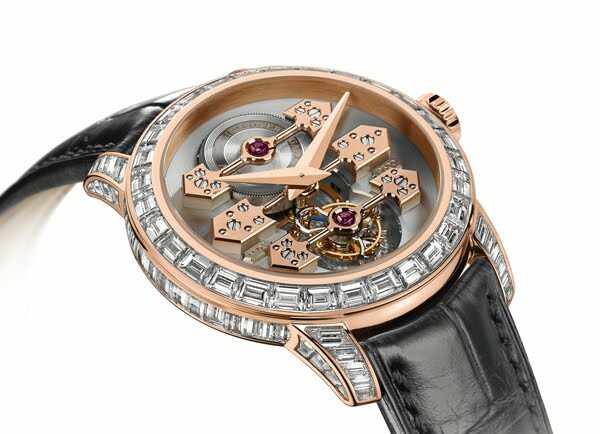 The Tourbillon device is also the subject of particular attention, its 72 component parts being meticulously assembled within a space only 12 mm in diameter. Preciously decorated, every part is in harmony with the sophistication of the design. The upper and lower cages are beveled and hand-polished, as are the bridges, and the balance keeps its equilibrium thanks to gold regulating screws,. Under the sapphire crystal with its anti-reflective treatment, the three bridges carved out of pink gold form a striking contrast with the color of the platinum. This combination of materials gives the timepiece a contemporary air of distinction and a strongly-marked character. 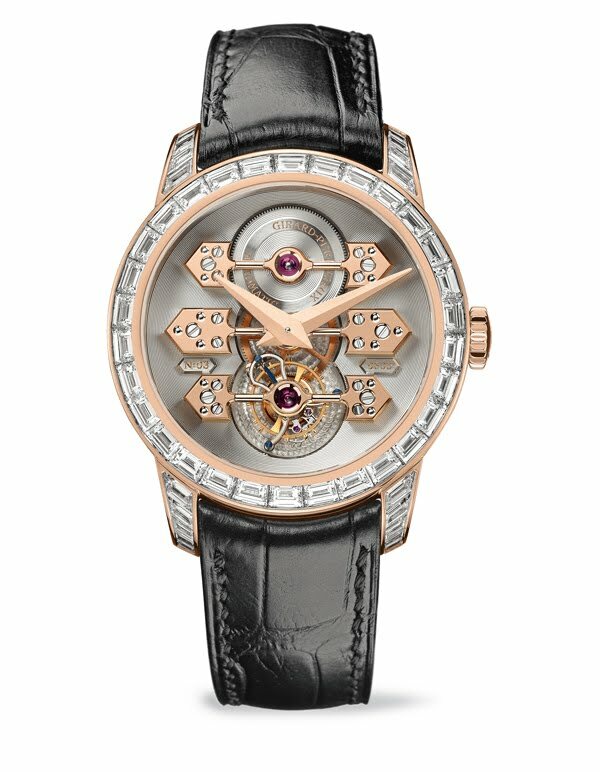 Polished and diamond-set, the oar-shaped pink gold hour and minute hands impose their powerful profiles. "Behind the scenes" the famous GP 9600 self-winding movement is busily at work. Entirely conceived, manufactured and assembled in the Manufacture's workshops, it has all the qualities of the finest Haute Horlogerie mechanisms. The icon of the brand and the very symbol of the history of Haute Horlogerie, the Girard-Perregaux Tourbillon with Three Gold Bridges is also available in a limited version of 18 pieces, set with 88 diamonds on the bezel, the case-center and the lugs. The baguette cut of the gemstones contrasts with the roundness of the case to form a sumptuous impact, reminding us that time is always infinitely precious.